The esports industry has grown to new levels. Tournaments have become larger. Prize money is getting serious, and more viewers are tuning into major events. With all the popularity, more gamers are looking to turn pro and make it a career. However, understanding the pitfalls of entering the industry isn’t as easy as one may think. Although becoming a professional player is a gamers dreams, the dark side of esports is something that they need to be aware of. The esports scene has come a long way. With the flashy lights, major tournaments, large crowds chanting their favorite team, it’s an industry that many gamers would love to be part of. Games like League of Legends, Counter Strike, Call of Duty and Dota 2 have become popular esports titles that now bring in hundreds of thousands of viewers at big tournament. 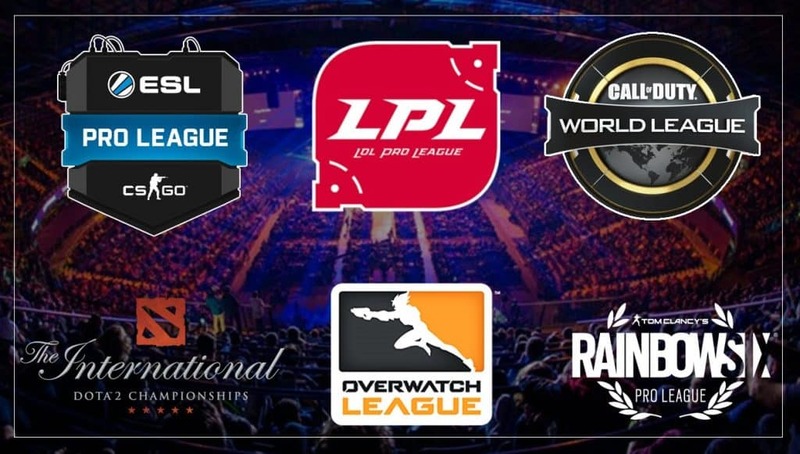 The CWl, ESL Pro League and LPL were all born due to the growth of competitive communities. News sites report wonderful stories of championship victories, broken records, new triumphs, and teams reclaiming their glory. However, not everything is as glamorous as it seems. Esports does have it’s pitfalls, and unfortunately it’s the players that are the ones who are affected the most. 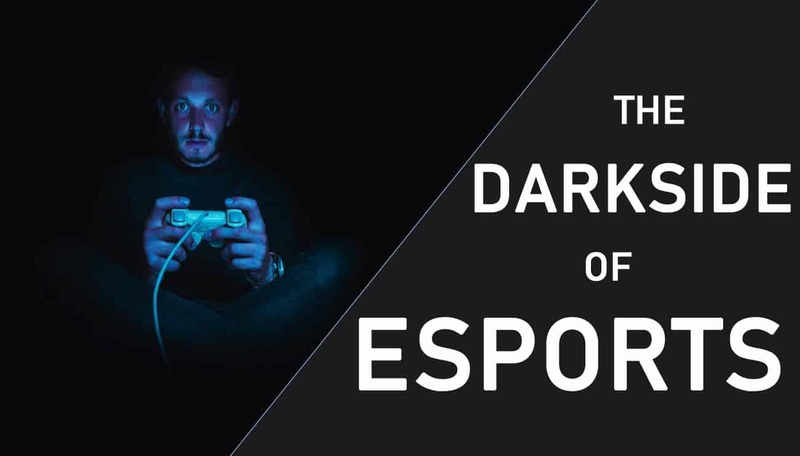 As Ursula K. Le Guin, one of America’s great novelists once said, “When you light a candle, you also cast a shadow.” Beyond the beautiful bright lights of the esports world lies negative issues that need to be addressed. In this article, we take a look at the dark side of esports that gamers on the outside might not be aware of. Competitive gaming has always existed. In the 80’s, children would rush to the local arcade to beat someone’s high score. The 90’s brought Friends closer together as they competed in their favorite fighting game. As the video game industry grew, the multiplayer games were introduced to gamers. This brought a whole new level of competitive gaming. Now, gamers were able to play against teams on their PC’s. This was all through a LAN connection (local-area network). Muliplayer games evolved over time to different platforms. First to the PC when the internet was introduced. Later towards consoles; Sega Dreamcast being the first. More over, playing multiplayer games was a hit on the PC, and starting gaining ground on consoles in the early 2000s. Fast forward today and competitive gaming is now an organized event which is called esports. It is close to a billion dollar industry, with Newzoo expecting it to cross the billion dollar mark sometime this year. With this type of information, many individuals and business see an opportunity to capitalize on the growth. This is where the dark side of esports really begins. As people see opportunities, some don’t see the negative effects of participating in the industry. Here are some of the issues that gamers can face when perusing their dreams of becoming a professional gamer. There’s a positive side of esports that gamers are familiar with. The dream job of playing your favorite game and get paid doing it. Or the incredible people you meet along the way; making new friends, establishing a strong network professionals and industry insiders. Nonetheless, there are things about esports that aspiring gamers should know about. We’ve complied a small list of some of the issues that gamers should be aware of. Heath is a serious topic when it comes to esports, and is at the top of the list. In the competitive culture of esports, players train regularly to stay a head of the game. Players spend hours in front of a screen, sitting down the whole day. Hand-to-eye coordination can get rusty after a few days of not playing which is why so much time is dedicated to playing games. Spending long hours in front of a screen can lead to an unhealthy lifestyle if you’re not careful. Below are the type of health concerns that some pro players have encountered. Heart Disease: A study was done between two groups; truck drivers and conductors. 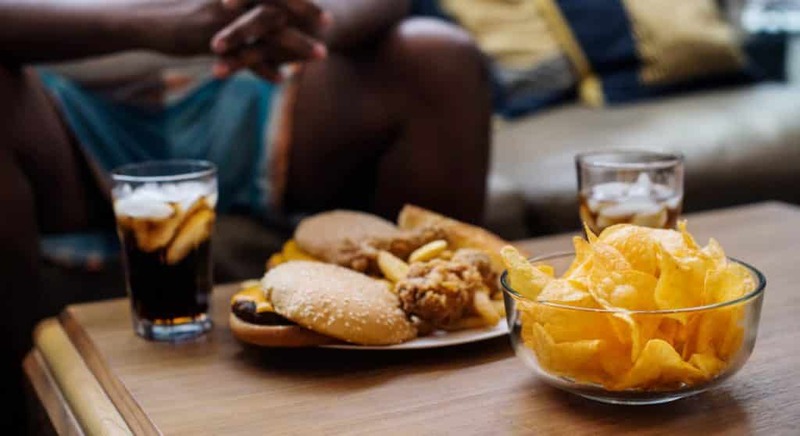 With diets remaining the same, truck drivers were twice as likely to get heart disease as they are sitting for most of their job. Esports spend the majority of their days sitting; as Lee “Faker” Sang-hyeok, an LoL professional player claims he spends a minimum of 12 hours a day playing. Cancelling out Exercise sessions: According to WebMD, going to the gym on a regular basis is pointless if you end up sitting for 7+ hours in a day. The gains you made at the gym will be cancelled out. Risk of Diabetes: Doctors believe that sitting for long periods every day may change the way your body reacts to insulin; the hormone that helps burn sugar and carbs for energy. Deep Vein Thrombosis: Gamers could get DVT for sitting all day. DVT is a clot that forms in your leg and can be serious if it breaks free. Weight Gain: An obvious effect of sitting down all day. Less movement equals less burning of calories. Anxiety: According to WebMD, staring at a screen all day can disrupt your biological clock and make you more anxious due to the lack of proper sleep. Furthermore, spending too much alone time also links to social anxiety. Posture Issues: It’s important that you have a proper gaming chair for back support. Sitting for too long can cause stress on your back muscles, spine and neck. It’s a recipe for getting a hunchback. Try to sit proper in your chair by leaning your back against the chair. Spontaneous Pneumothorax : In laymen terms, inactivity aka sitting down all day can lead to a collapsed lung. Kotaku reported one particular player from LPL named Hai Du Lam, who had to drop out of a huge event due to a collapsed lung in 2014. Carpal Tunnel Syndrome: Caused by repetitive movements over long periods of time. Many top sites have reported pro gamers who had to end their career due to this wrist injuries caused by Carpal Tunnel Syndrome. Poor Nutrition: Playing games for long periods of time also means missing out on important meal times during the day. Playing games for hours, and feeding off the adrenaline rush from playing in a competitive room can one to skip meals. It’s important to keep some food near you when you’re playing (fruits, nuts, water). Burnout: Doing anything too much can cause burnout, especially playing video games for 12 hours straight. Most young recruits in the esports world are able to handle it. But as they get older, it becomes harder to stay focused and mental fatigue plays a role which affects players performances. To by-pass most of the items above, some gamers resort to performance-enhancing drugs, as was the famous case with Semphis; a CS:GO esports player who stated that his whole team was on Adderall to keep their concentration and focus when playing CS:GO. This was due to the intense daily training routine the team did to stay in proper form. Another recent case was with TSM Hamilin. 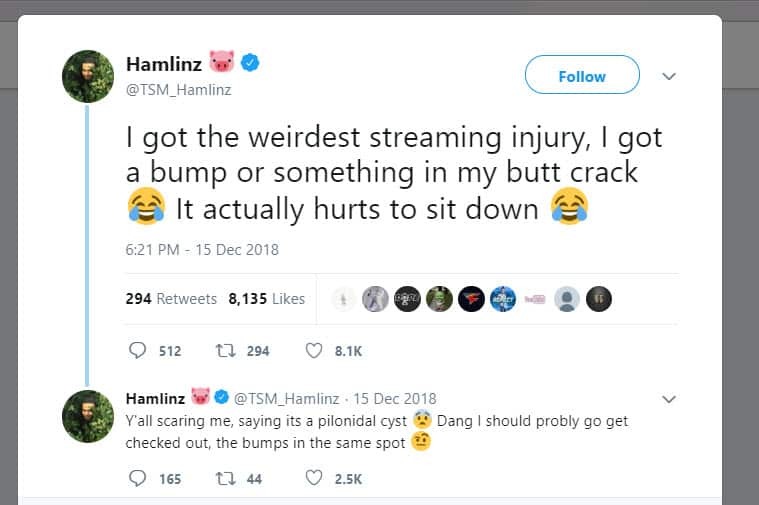 He had to stop streaming because of a cyst that formed, which he had to get surgically removed. It’s a dark side to esports that goes unnoticed due to the endless days of playing. Many professional gamers fall victim to falling out of place after their esports careers. The issue comes from poor planning, and not being farsighted. Landing a dream job can cloud ones mind, and for a young gamer joining an esports organization isn’t exactly thinking about where they will be in 10 years. Sampling a size out of 176 Call of Duty professional gamers who are now retired, the average age comes out to be 25 years old. There are outliers, with retired Call of duty players being as young as 20 years old. Considering the age restrictions to joining an esports team, some professional gamers won’t even last 10 years; thus the future planning will come sooner for many. 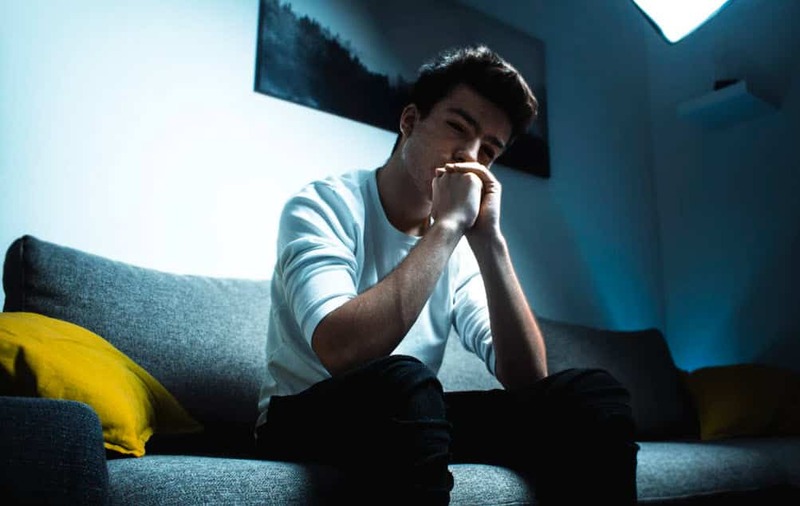 Life after esports can be very difficult for those who have not planned ahead, which is another dark side of esports topic that needs to be discussed. Although there are opportunities in the esports industry for players who retire such as a coaching job, many haven’t planned far down that road. Especially young gamers who retire early. However, there may even be a bigger problem than not planning ahead after making an esports team, as we see with the next case. One user on Reddit brought this tweet to the attention to the Call of Duty community. A 15 year old gamer made a tweet that sent shockwaves across the gaming community. “No way I did it, I convinced my parents to let me drop out‼️ School will never determine your success“. 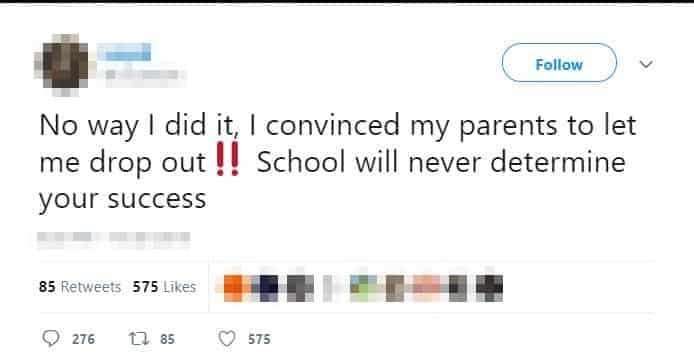 The fact that he was able to convince his parents to drop out is baffling. To state that school will never determine your success reinforces the issues of young gamers not having a clear path for their future. But how can you blame a child to think this way if they are not receiving any guidance from their parents? Furthermore, if one gamer has this view, surely there will be other young gamers that do as well. This is just one case. How many gamers are actually thinking of doing the same thing as the 15 year old gamer? There needs to be programs in place for something like this, but, the industry isn’t there yet. And all we can hope for are more players like SiLLY coming out and giving their opinion, or parents being more responsible and not agreeing to have their child drop out of school. There are pro gamers who do attend school and play professionally. It is probably one of the most difficult things to do, as pro gaming requires most of your time. To fit your schooling in a busy schedule is near impossible. But in the example of FaZe Attach, he was one of the few who were able to do that as he showed proof on his YouTube channel back in 2015. This positive reinforcement is what is needed to show younger gamers who are looking to join the esports world. Going to school and playing professionally can be done, but requires proper time management and self-discipline. 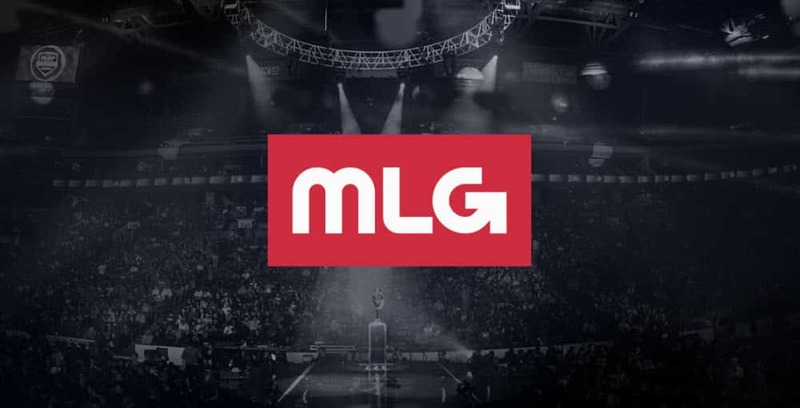 Many pros are at an all time high when they are playing for a major esports organization. When you’re at the top, you feel invincible. However, not every pro gamer makes enough money to be well off for the rest of their lives. Some players turn to the streaming life on Twitch or Youtube where they try to get another stream of income. The pressure of establishing a loyal fan base, selling yourself to viewers, having a persona that gives viewers a reason to continue coming back is incredibly stressful. Streamers need to be committed to their role as the lack of streaming equates to lower revenues. Keep in mind that not all ex-pro gamers stay in the industry and pick up a job, which is why they turn to streaming. So what’s plan B? One famous ex-CS:GO player who recently retried was PashaBiceps, considered one of the best to ever play the game. He made a YouTube video following his retirement, shedding light for other gamers looking from the outside in. The YouTube video showcases life after a successful esports career. The video shows PashaBiceps going from being a world champion in CS:Go to waking up and getting ready for his job. 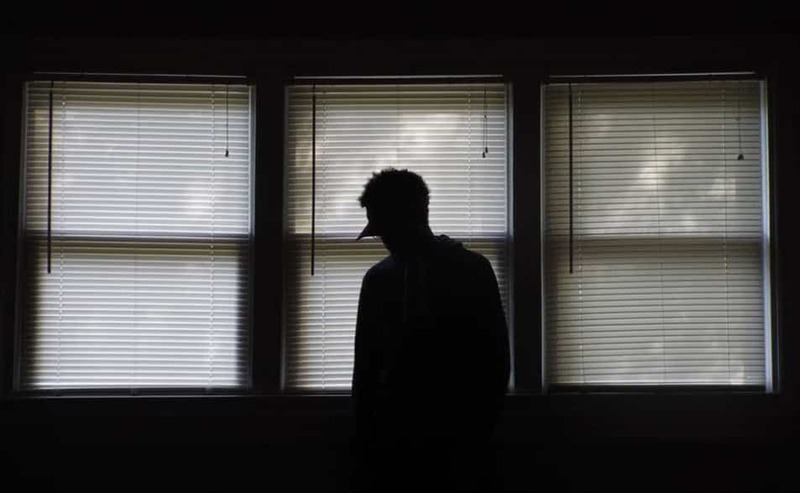 His journey to work is dark in the video, to depict hard times ahead. In the video, Pasha arrives to work and starts to make preparations to make bread. During Pasha’s shift, his boss interrupts him many times, giving him heat for not doing his job right. As simple as baking something like bread might be, even Pasha was having a hard time doing it. The moral of the story is to better prepare yourself for the future, as Pasha was having a hard time even baking bread since gaming as all he knew. It’s a dark side of esports that many ex-gamers unfortunately see after they retire. Here’s the powerful video that PashaBiceps shared on his Youtube channel. PashaBiceps first language isn’t English; he speaks in Polish at the end of the video. However, he was able to translate his message in English and posted it in the description of the video. “Hello and welcome to the official Papito Youtube channel. I made this video for you and I hope that it will encourage you and your parents to think about what is the most important in life. As you know, most pro gamers don’t know what to do after their careers end. They didn’t think about what’s next because they spent most of their lives playing the game. They don’t have any experience apart from playing games so make sure that it won’t be the same for you. There’s many things that one can do after their careers, but planning everything out beforehand is the hard part. Esports players have an obligation to fulfill contracts, and perform at the highest level. They also have the stress of building a brand for themselves (and for the organization). The dream of getting paid while doing something you love still holds true, but it becomes real work where performance matters. Branding becomes a mandatory thing in order to build your brand, as well as building your organizations brand and market their product. The words “subscriber count”, “subs”, “subscription”, “follow” all become words that are used on a daily basis. Esports players have to put themselves out there, constantly updating their profile on social media and getting more followers. The pressure of gaining new followers becomes a real thing, and the old saying “popularity contest” is born in the digital world. Once players have a large subscriber/followers base, another issue arises from all the self-branding. The issue of security becomes real. Professional players turn into esports celebrities, and their fan base can go well beyond the hundred thousand mark (for example, Ninja has 21 million subscribers on YouTube). Of those hundreds of thousands of subscribers will be some bad apples. It’s a dark side of esports that many aren’t aware of as Austin Wilmot, an Overwatch player for the Houstin Oilers found out after tweeting this. Waking up to death threats sure is zany so I’m closing my dms. I still love you all though. The esports scene can attract some of the worst human beings on the planet, which is another. Those that have their own personal agendas. There was no better case than what happened in South Korea years ago. To see where the dark side of esports first emerged into public light, one would have to get familiar with the scene in South Korea, which most consider the mecca in the industry. In South Korea, gaming is a serious thing. It’s a part of most Koreans everyday life. 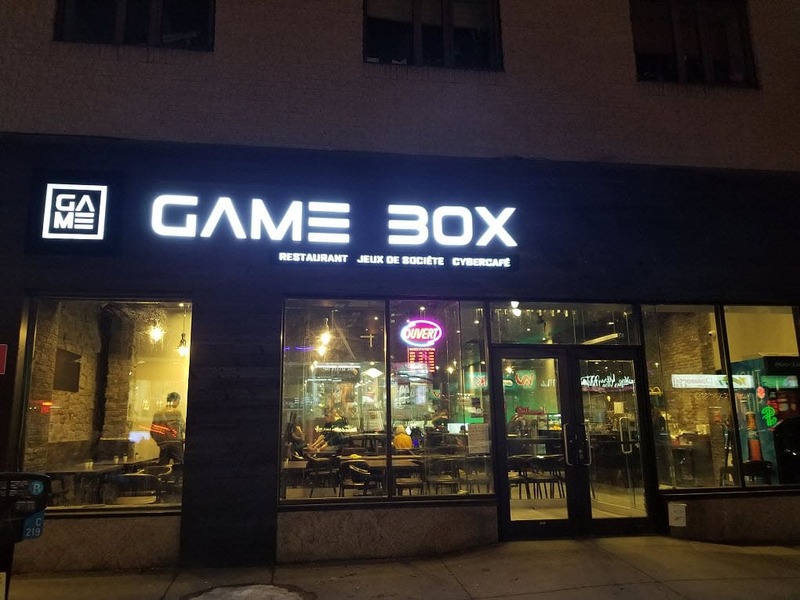 Gaming cafes, also known as PC bang, are on every street corner. It’s a place where friends can spend time playing multiplayer games. It’s also a place for young gamers who aspire to become professional players. As opposed to North American gaming where gamers are use to playing multiplayer games at home, PC bang is where gamers go to play, and this is a huge part of the gaming culture. This is one of the reasons why South Korea is a dominant global force in esports. It’s not about having fun either. Future stars are born at PC bangs. The concept is had gained traction in North America. Most young gamers in Korea start off at a PC Bang where they play daily, in hopes of becoming very good and turning pro. Some of these gamers eventually make it onto a professional gaming team. At this point in their life, they are required to move into a “gaming house” where they train from morning till night for a particular game. Their gaming becomes a career and a regular job. These young gamers are often recruited at the age of 17, and the gaming house will become their new home until they change teams or retire. This is where the story of Cheon Min-Ki plays in. The real dark side of esports came to the publics view when Cheon Min-Ki, a professional esports player by the name of “Promise” tried to commit suicide. While playing as a League of legends pro player, Cheon Min-Ki was forced by his manager to engage in match fixing for financial gain. Cheon Min-Ki, aka Promise, was told that if he did not cooperate, he would be expelled from the team and unable to join any other organizations. The thought of losing everything for Cheon was unimaginable as gaming is a part of life in Korea. The attempted suicide made headlines, and brought the issue of match-fixing and pressure on players to the spotlight. There are probably thousands of untold cases before this incident in the dark side of esports, but it was “Promise’s” case that took a step forward. What people see on the outside can be further from the truth. And toxic individuals do exist in the industry, waiting for their chance to exploit vulnerable players. There are other aspects of being a professional esports player that aspiring gamers need to understand. With that role comes much criticism and negativity, both on the internet (social media) and off of it. Being a pro player requires a strong mental game. It’s one thing to be able to handle yourself in the heat of a battle; it’s also another to handle the negativity that might come your way if you don’t perform in matches, or if you give an opinion or two on a subject. Pro gamers are celebrities, and will be more susceptible to the same negativity that comes with being a famous Hollywood actor. They’ll always have a crowd of trolls that are ready to jump at any opportunity. The points outlined here isn’t made to discourage any aspiring gamers who want to enter the world of esports. The points here are to bring awareness to the dark side of esports. To help gamers be prepared to face some tough situations during their career as well as planning ahead for the future.